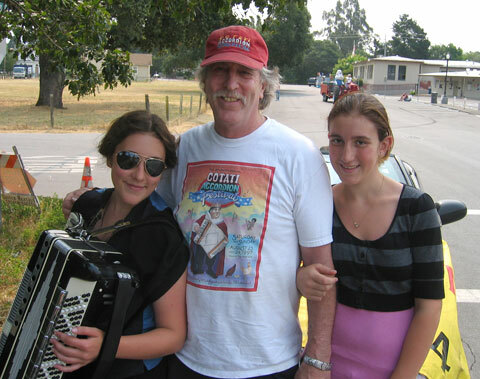 As part of the Cotati Accordion Festival’s grass roots promotional push, I participated in the Cotati Kid’s Parade today (7/12/08) with festival organizer Scott Goree and his daughters, Renee and Rachel. The theme was the above mentioned Magical Kingdom hence that lovely millinery fantasy I am wearing. 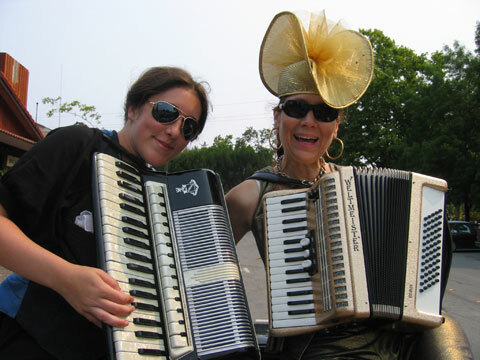 Perfect weather again, Rachel played her vintage “Nobel” 120 bass accordion, Rachel tossed candies to the kids and I played “Street Dog” many times. 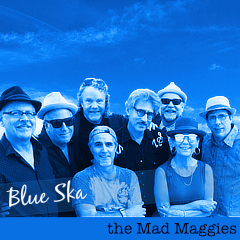 It’s a song I know the late Jim Boggio liked. And I had a chance to say hello to Lynn Woolsey.